Frank Valley – A Texas gunman and cowboy on the LS ranch in Tascosa, Texas, Valley was killed by Len Woodruff in 1886. John Wilson “Texas Jack” Vermillion, aka: Shoot-Your-Eye-Out” Vermillion (1842-1911) – A gunfighter known for his participation in the Earp Vendetta Ride and his later association with Soapy Smith. 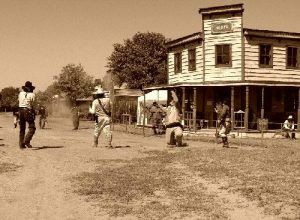 Fredrick Tecumseh “Fred” Waite (1853-1895) – A Chickasaw Indian, Waite was a short-time member of Billy the Kid’s Gang and gunfighter for the Regulators during the Lincoln County War, but, would later serve as a lawman and prominent politician. E.H. Wakefield – A gunman in the Lincoln County War, Wakefield rode with the posse that killed John Tunstall on February 18, 1878. Thomas J. Walker – A New Mexico gunman, Walker shot and killed Albert Kjellstrom in January 1885 in Socorro. Tom Walker – A member of the Seven Rivers Warriors during the Lincoln County War in New Mexico. When the conflict was over, he was Killed in a saloon gunfight in Seven Rivers in Seven Rivers, New Mexico on November 23, 1879. Jim Wallace – A member of the John Kinney Gang, during New Mexico’s Lincoln County War. Wallace fled to Arizona after the gang broke up and was never heard from again. James Warren – A gunman, Warren killed W.F. Markham on September 2, 1886. Ben “Buck” Waters – A member of the John Kinney Gang during New Mexico’s Lincoln County War. Afterward, he disappeared. Sam Wilson Watson – A gunman and saloon keeper in Folsom, New Mexico, Watson shot and killed a gambler named Fred Brown. Frank Wolcott – A gunman and mercenary commander, Wolcott led an army of gunfighters and soldiers to quell the Johnson County War in April 1892. The U.S. army ended the war and the mercenaries were arrested and later acquitted. Charles Wolz – A gunman in the Lincoln County War of New Mexico, Wolz was with the posse that shot and killed John Tunstall on February 18, 1878. 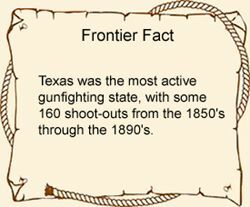 Len Woodruff – A cowboy and gunman, Woodruff instigated a gunfight between LX and LS cowboys on March 21, 1886, in Oldham County, Texas. John Worley (18? ?-1875) – A gunman and Mason County, Texas deputy sheriff, at the time of the Mason County War, Worley was shot and scalped by Scott Cooley on August 10, 1875. This was in revenge for what Cooley believed as Worley’s part in the death of cattle rustler, Tim Williamson. Francisco Zamora – Fought with the Regulators in the Lincoln County War of New Mexico. He was shot eight times by Murphy–Dolan men and killed at Lincoln, New Mexico on July 19, 1878.